Designed for mobile photographers, the Battery Case for iPhone XS Max from Shuttercase helps make the process of capturing photos and videos more user-friendly. It features a mechanical shutter button, for a more DSLR-like experience, plus a replaceable camera handle which helps provide a more secure grip when you're holding your phone in your hand. Embedded within the camera handle is a 3000mAh battery, which provides power beyond what your phone's built-in battery has. If you prefer to use this case without the battery, a standard handgrip with a leather surface is included. Also included is a micro-USB to USB cable for recharging the battery, plus a black pouch for the camera handle, a black nylon rope, and two thumb buttons. This case features a white lens mount. Please note that this case is compatible with Moment's Wide and Portrait v2 lenses on the first (wide) iPhone lens. It is compatible with Sirui lenses. The mechanical shutter button doesn't rely on Bluetooth, software, or hardware to interface with your iOS device. Just initiate your phone's camera app and press the shutter button embedded in the case. The mechanism is safely integrated into the case and gives you the satisfying click of a real camera. Shoot with one hand, shoot horizontally, or shoot vertically. Tired of using one hand to hold the phone while the other one fumbles around on the touchscreen? Shuttercase gives you a camera handle that enables to you hold and shoot your phone with one hand, just like a lightweight DSLR. Better yet, when you don't want the camera handle, just remove it and replace it with the included cover. A lightweight everyday case is included as well. Shuttercase's removable camera handle does much more than just make it easier to take photos. Inside is a powerful battery that recharges your phone as you take photos and videos. The design philosophy of Shuttercase is to develop an open platform for smartphone add-on lenses so that you can try different things. Their lens mount plate is replaceable and removable. This feature, combined with its mechanical shutter button and high-capacity battery, makes your phone a real workhorse. Currently, Shuttercase for iPhone XS Max is compatible with Sirui lenses, with more to come. 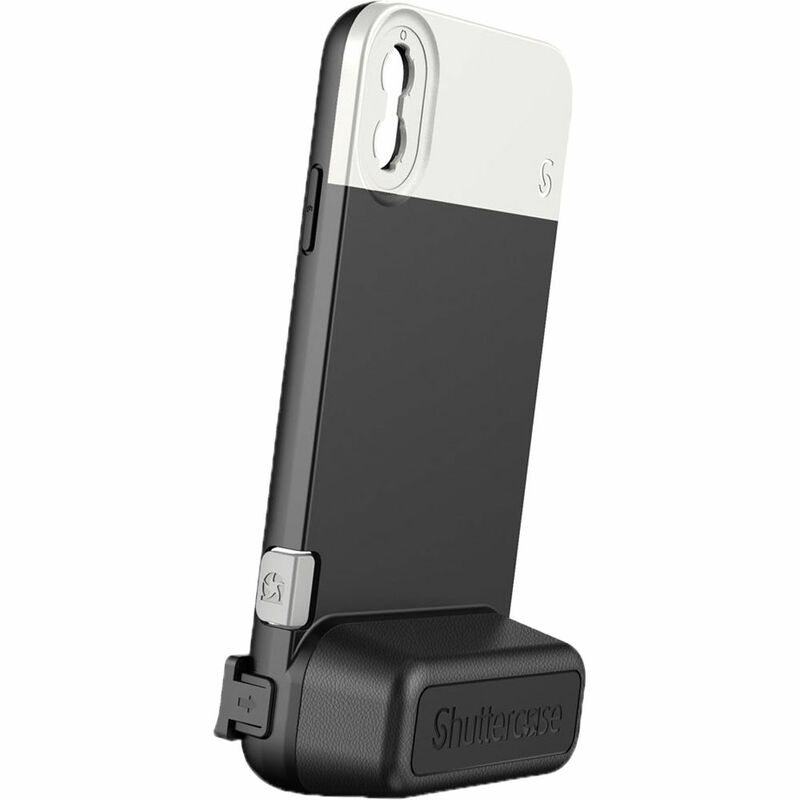 Shuttercase's removable camera handle also acts as a stand for your phone. It's easy to watch movies or browse through your photos hands-free in either horizontal or vertical position. You can also position the case vertically and set the self-timer. Shuttercase designed this with everyday users in mind. Just remove the handle, attach the thin hand grip, and you'll get a lightweight protective case. The mechanical shutter button is still functional once the battery is removed. A separately-sold leather strap is available to match your Shuttercase and make carrying it more user-friendly when you aren't shooting.